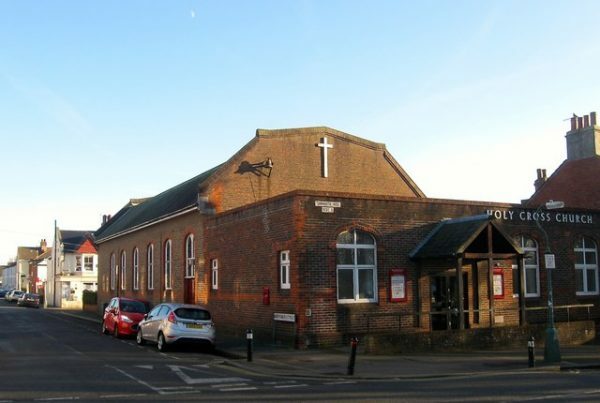 The church was opened in 1903 as a chapelry in the parish of St Philip, but was transferred to the parish of the Bishop Hannington Memorial Church in 1945 after the parish boundaries had been redrawn. The church of 1903 may still be discerned in parts, notably two small windows in C15 style in the east wall. Otherwise, the windows have painted wooden frames but vestigial four-centred heads. They could date from the original building, but if so, were probably altered after a fire in 1969. This has complicated the structural history, as the roof was destroyed (church website). The present low pitched one with canted gables dates dates from the rebuilding in 1970 and there were further additions in 1986. The west porch, which combines a cross with the structural carpentry, probably dates from after the fire also.